Here’s how to access the Sky Super 6 app available for all mobile devices, including Android, iOS (iPhone, iPad), Windows and Blackberry. From the popular Soccer Saturday show on Sky Sports comes this completely free competition with a simple criteria: Predict 6 scores and you could win the £250,000 jackpot. If the Sky Super 6 jackpot isn’t won, the highest scoring player picks up £5,000. There are a number of options that you can use to enter the Sky Super 6 competition on your mobile. You can get the Soccer Saturday Sky Super 6 app on your mobile by signing up without a Sky Bet account at https://super6.skysports.com. This is the easiest way to register, and after that you can use the mobile web app and create a shortcut to Super 6 on your homepage. If you’ve already got an account with Sky Bet, you can use your existing Sky Bet login details to gain access and play. If you don’t already have one and need to open a new account you can create yours here. This is a simple way to play if you also want to place bets as well as playing Super 6, as you then only need your Sky Bet User ID and PIN to log in and get predicting your scores. Plus, by signing up with Sky Bet you also get to claim to the free bets on offer. 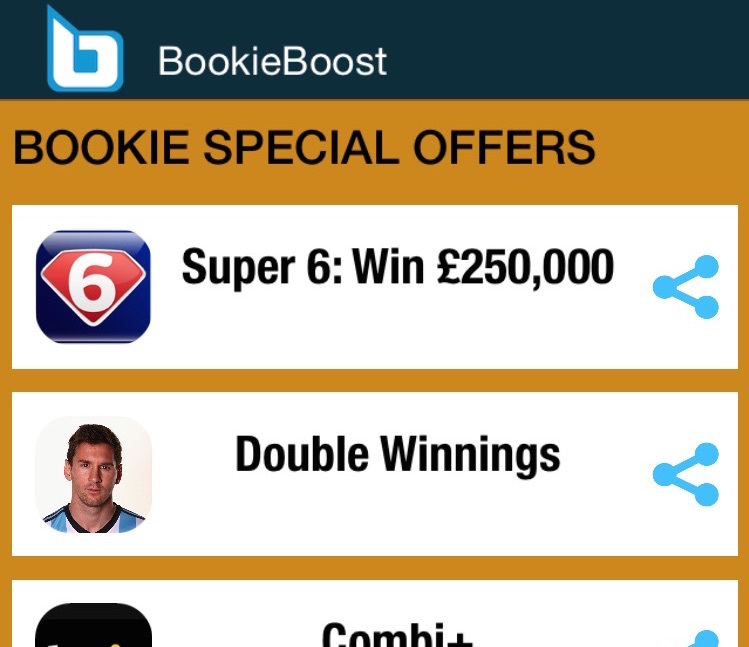 If you’re an Android or iOS user and want to install an app on your device for using Super 6 we recommend that you download the BookieBoost app which does just that. Better still, it gives you access to free bet offers across all bookies PLUS free bet tools including live scores and match previews. Once you have downloaded and installed BookieBoost, go to the ‘Special Offers’ area to access Super 6 (as pictured above). There are yet more goodies available after you’ve registered to play Soccer Saturday Super 6, as you can then additionally use your Super 6 login to play Sky Sports Fantasy Football. Think it’s impossible to win the Super 6 jackpot? Think again because it has been done before. Taking a look now at how to accumulate points on Super 6. You can earn up to 5 points for each match; That’s two for each correct result or a max of five points for predicting the correct/exact score. Using an example, say you select Tottenham Hotspur to win 2-0 and Spurs do win, but by a different margin (e.g. 1-0) you are given 2 points. However, if they win by your exact scoreline prediction of 2-0 then you collect the maximum five points for that match. Simple. The rules are clear cut and simple – if you can predict the correct scores for the six selected matches you have a chance to win £250,000. If you do that and nobody else does, the jackpot is all yours. If nobody gets all six scores correct then the £5,000 guaranteed prize will go to the person with the highest score of the round. It’s not always Premier League matches that are featured, either. Super 6 app games can be chosen from any domestic leagues including the Scottish Premier League, or even international matches. Naturally, you have to make your predictions before the kick off of the first game of the round as advertised on the game site. With so many people playing Soccer Saturday Super 6, sometimes a method of separating those who have the same number of points (to decide who gets the guaranteed prizes) is needed. Enter the ‘Golden Goal’ tiebreaker, which is the prediction for the time of first goal in any of the Super 6 fixtures. You’ll be asked to predict this when making your correct score predictions. To be clear, the Golden Goal isn’t used as part of the Jackpot Competition, though, as all winners share that prize. To check out how well you’ve done each week in this competition you can view the leaderboards. Plus, there’s the monthly and season league tables monthly and season league tables. There are also other options if you want Super 6 as standard app from the Google Play Store or the App Store but these are not recommended. The Android version is simply not as good as the mobile version and the Apple iOS version is exactly the same as the mobile web version. It is better to create a shortcut to this on your home page as discussed above or simply use BookieBoost which which offers far more. The Sky Super 6 app is responsive to mobile devices and therefore works on any smart phone or tablet. For Windows Mobile and Blackberry users, the goal is achieved via the mobile web app site which is the same as the Android and iOS apps as previously noted. All users can access it securely via at https://super6.skysports.com.